Hello, this is Capt. Clay and I’d like to welcome you to Angler Management Inshore Fishing. My place, Orange Beach, is a wonderful town with beautiful beaches. It’s also a really good fishery for many saltwater species. If you want to have an authentic fishing trip, come along. 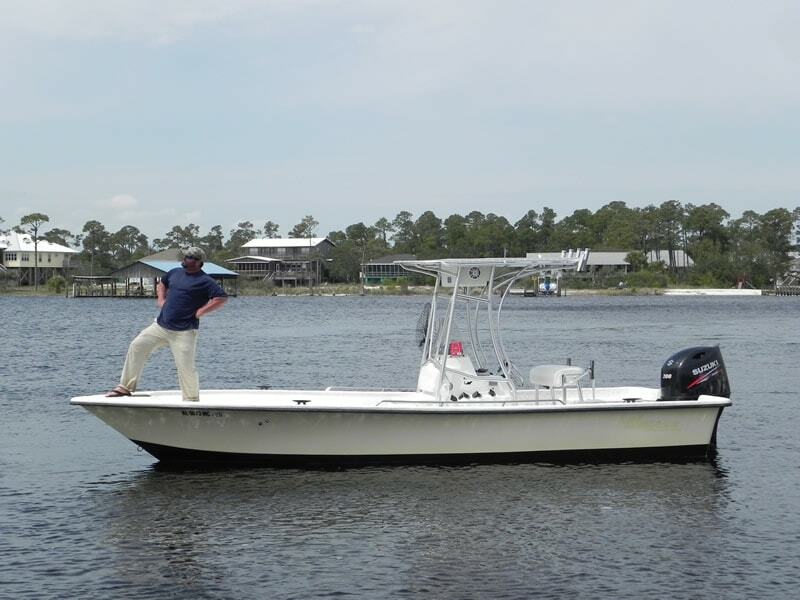 I’ll take you aboard my 24’ Kenner center console which accommodates six anglers. She is powered by a 2016 200HP Suzuki outboard, and comes equipped with GPS, fishfinder, VHF radio, live well and ice box. In all of my trips, I provide fishing gear, premium live bait – talk about matching the hatch – and licenses. I’d be happy to clean, fillet, and bag the catch for you. Early spring is the best time for a multi-species bag limit. With water temps warming, Sheepshead, Pompano, Speckled Trout and Redfish are all viable options to target. During late spring early summer, Flounder (my favorite) and Spanish Mackerel start to show, with the opportunity still there for Reds and Trout. Once the heat of summer arrives, so do King Mackerel. If you’re looking for a fight, the trips I offer (with light tackle) are the most bang for your buck. Summer is long on the Gulf Coast, and If the weather cooperates on the Gulf of Mexico, Kings and Spanish Mackerel are pretty much the go-to fish bite. Once we get into September, Redfish start to show up in large numbers and that pattern lasts through fall and winter. The most important thing for me is that you get to fish. I offer four hour trips, and we can extend them if the fish are biting and you’re eager for some more. You will be fishing within minutes of boarding the boat – spend more time fishing, not riding! Bring whatever you want to eat or drink, and I’ll cover the rest – Let’s go fishing!